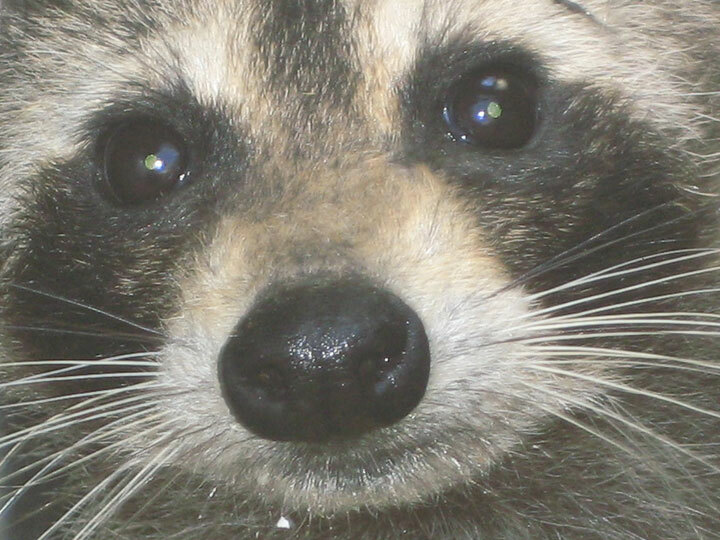 02.27.2007 - This is a photograph that I managed to take close-up of a raccoon. It was hiding in a duct, and I was able to get my camera very close. I caught this critter, so I know it was a female. But with raccoons, I can always tell anyway. Male raccoons have a different appearance than females. The differences are subtle, but it's easy to tell, just like it's easy to tell with people. Female raccoons simply look more feminine, or even prettier, if you will. If you spent as much time looking at raccoons as I do, you'd start to notice the difference as well. That's about all I have to say on that matter, so I will now paste in a few various emails that I've received recently regarding raccoon problems. Enjoy! Hey David, I live on a canal in Miami Dade. I have a pond in the back yard with koi fish. A few days ago, I'm almost positive a or a couple of raccoons went in my pond and destroyed my plants and ate a few kois. The next day I put a havahart trap but no raccoons were caught. Do they come every couple days? I would think since they got my fish they would come every night if they are there for the taking. Also, what do I put in the trap as bait? I hear cat food, bananas, apples, marshmallows. Once I catch one do I stop or keep putting the trap? Please advise and thanks.